If you are a customer of Build Your Library, you will no doubt have noticed several graphic novels or comic books scheduled into our secular, literature-based homeschool curriculum. You may have also noticed many additional recommendations on our companion YouTube channel or other BYL blog articles. Today’s world is full of distractions. Hand-held video games and tablets. Netflix, Hulu and the internet. If you are going to teach with stacks of dry and boring textbooks, you are making it difficult to inspire a great passion for learning. That is why I spend so much time finding the best “living books” to incorporate into our lesson plans. But with the right mix of great engaging literature, a couple of well written and historically/scientifically accurate graphic depictions of classic topics is a terrific addition to keep lessons fresh and exciting. And who doesn’t want that? Well, perhaps if we were to try to pass off some Golden Age Comic Books from the late 1930s, a decade after her death… Or if we tried to include the latest Spider-Man saga… That probably wouldn’t work. But I am positive that a modern day Charlotte Mason would not turn her nose up at the Cartoon History series by Larry Gonick or the Amulet series by Kazu Kibuishi. Before I lose anyone to this “stretch,” lets talk about some of the CM teaching philosophies. Short and varied lessons come to mind. Charlotte Mason suggested that spending shorter blocks of time, maybe 20 – 30 minutes engaging your child’s mind would be a better than an reading a dry, formal textbook or listening to a teacher lecture for an hour. Perhaps if it was a “comic book,” your child might spend even longer at their studies? Perhaps they would be more engaged? Try it out for yourself. The main idea behind a Charlotte Mason education is to educate a child’s whole person. I believe the best way to do that, to reach their heart and inspire their mind, is with great literature. I would even go so far as to say that it’s stories. Stories are what capture your interest and tug at your emotions. You want your children immersed in lovely prose and vivid writings from authors who care deeply about their subject matter. If you can find an excellent graphic novel that meets this criteria, and is in an extremely kid-friendly format, I’d call this a win-win. So before you think I am suggesting your children run wild in the local comic book shop, grabbing all of the Incredible Hulk and Superman comics (which would be fine in moderation, but not for history and science lessons 🙂 )… We are looking for the good stuff. Although the depth of scientific understanding and knowledge of Bruce Banner and Tony Stark cannot be ignored, but I digress… These are going to be books that still pass the living-books test. They are well written by a passionate author. They will stand the test of time in your child’s (and your) mind and heart. There are many engaging and beautiful graphic novels for children. They can be enjoyed together or make perfect transition books for early readers. Especially for those who are ready to branch out into “real” books, but not quite ready for chapter books yet. Are We There Yet? – This is just a fun story about being bored and letting your imagination take you on an adventure. Drawn Together – A beautifully written and illustrated story about a boy and his grandfather learning to communicate without a shared language. You Can’t Take a Balloon into the Metropolitan Museum – This delightful wordless book is so much fun to look at and invent your own story based on the gorgeous illustrations. Filled with reproductions of famous works of art, this story would be a great addition to an art history unit. Human Body Theater – Set up like a play with the MC introducing each of your body’s organs and systems, this book is a lot of fun. By the time they get to the end of the show, your child will be an anatomy expert! Ancient Egypt: Tales of Gods and Pharaohs – I love all of Marcia William’s books – they are colorful and well written. This one focuses on Ancient Egypt, but she has books on Rome, Greece, Great Inventors, and even Shakespeare! These are a great supplement to BYL Levels 1 and Level 2 of our curriculum. The Solid Truth About States of Matter With Max Axiom – Max Axiom is the world’s greatest Super Scientist and he uses high tech gadgets to explain scientific topics in a really fun and exciting way. This whole series is fantastic, but this particular title is the one used in our BYL Harry Potter and the Goblet of Fire unit study. El Deafo – Cece Bell writes about her childhood, living with hearing loss, and adventures with Phonic Ear in this endearing story about a child trying to find her place in the world. Beast Academy – I have only used their Level 2A program with my youngest, but this series of math curriculum is designed as a graphic novel following characters at school learning math! This program is very challenging. It can be used as a supplement or as your full math curriculum, depending on your needs. Cartoon History series – This series of books is so much fun I use it as the history spine in both BYL Levels 10 and Level 11. Covering prehistory to modern day, Larry Gonick makes history fun! I dare anyone who says history is boring to read this series! Soviet Daughter – This graphic memoir covers the tumultuous period in Russian history from the Revolution in 1917 through the USSR. It would be a great supplement in BYL Level 11. Climate Changed – I recommend this book to everyone. The author covers both the science and the philosophy behind this complex topic. I haven’t read a book on climate change that is as extensive as this one, nor as readable. Illegal – This story of two brothers from Ghana trying to get to Europe to make a better life for themselves explores the plight of undocumented immigrants. Persopolis – This graphic memoir is about the author’s experience growing up during the Iranian Revolution. It’s beautiful and heartbreaking and would make a good companion to BYL Level 7 or Level 11. American Born Chinese – A story about being an immigrant in America and trying to figure out how to both fit in and be yourself. Barefoot Gen – I loved this book so much, we use it in BYL Level 11. This is the memoir of the author’s experiences living through WW2 and the bombing of Hiroshima. The Last of the Sandwalkers – On it’s surface, this is a cute and funny story about Beetles, exploring the world outside of their habitat. But it’s also about the scientific method, entomology, fighting against an authoritarian government… it’s fantastic. We have scheduled it into the BYL Level 9 curriculum. 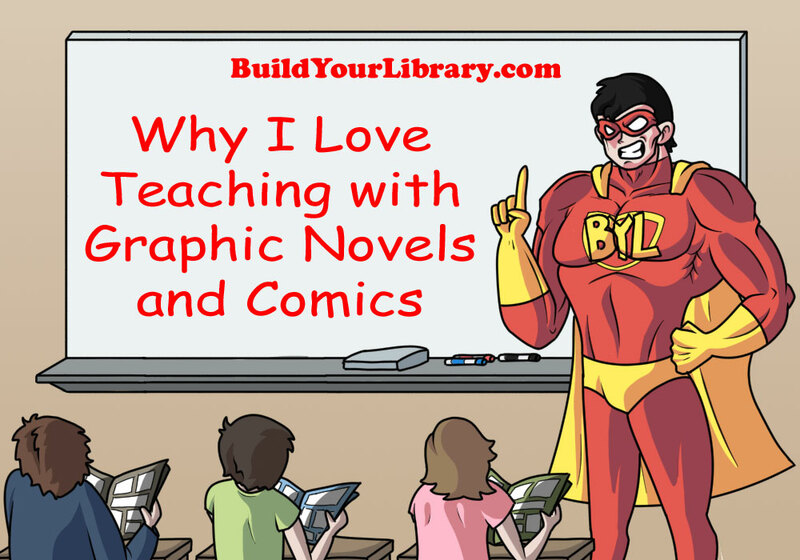 I hope that I have inspired you to include graphic novels in your homeschooling. Not only do they offer great reading material, they give us another way to experience stories. If a picture is worth a thousand words, then a handful of graphic novels included in your homeschool curriculum are worth a whole library! Your child will love it. Now if you’ll excuse me, I have to go catch up on reading The Walking Dead comics. I got 5 issues for Christmas. Purely for leisure reading, of course. I haven’t figured out how to schedule them into the BYL curriculum. Yet.